Go Wash is a convenient, re-usable washing vessel for travel or when you're away from home. 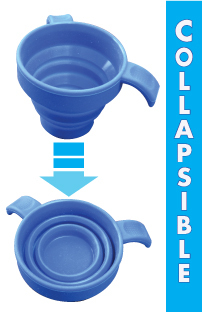 We made it large enough to hold the halachically required amount of water for hand washing and small enough to fit in a purse, hand bag and many coat and pants pockets. Go Wash collapses on itself to take up less space so you can take it wherever you go. Go Wash is made of a flexible material so you don't have to worry about it breaking from being dropped or being squished by heavy items in your travel bag. Go Wash also comes with a hard travel case to keep it clean. Next time you take a trip, go to the park with the kids or are at the office, bring Go Wash!